The name derives from the Latin form of the Greek name "Ánna (Ἄννα)” from the Hebrew name “Channâh > Ḥannāh”, meaning “graciousness, he was gracious, showed favor”. 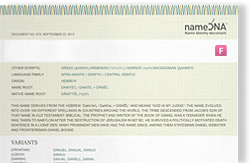 Hannah, also occasionally transliterated as Channah or Ḥannāh is the wife of Elkanah mentioned in the Books of Samuel. According to the Hebrew Bible, she was the mother of Samuel. Saint Anne was traditionally the name of the mother of the Virgin Mary, which accounts for its wide use and popularity among Christians. The name has also been used for numerous saints and queens. The mid-seventh century King Anna of East Anglia was one such male Anna. Anna is in wide use in countries across the world as are its variants Anne, originally a French version of the name, though in use in English speaking countries for hundreds of years, and Ann, which was originally the English spelling.